Gaslands is a tabletop game of post-apocalyptic vehicular mayhem. With fast and cinematic rules, it is designed to be played with toy cars, allowing players to ram, skid and race their way through the wreckage of a burnt-out Earth. 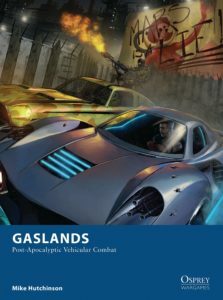 Gaslands is published by Osprey Games and winning of Best New Miniatures Rules at UK Games Expo 2018. Learn more about the game here.